I am truly blessed to be among an amazing group of men and women. This will be my third-year riding from NYC to Niagara Falls. I successfully rode all 500+ miles the last two years. Fingers crossed, that the third time is a charm!!! And I am giving thanks to GOD FIRST. Everyone who knows me knows I am a very private person. But I would like to share this with you. I have had health scares, dodged the bullet a few times waiting on my Pap smear results, and is always nerve racking waiting on the test results. Last year I went for my annual exam and it came back positive. I had a procedure and once again I had to wait to be retested six months later and praying a lot saying “It is your will, your way for me Lord”. I was retested and it came back negative. “TEARS OF JOY AND PRAYERS OF THANKSGIVING AMEN THANK YOU LORD” :). And thank you Dr. Santos. I love him and his team! I am blessed to have him as my doctor. As challenging as this ride is, it is the least I can do to help the fight against this UGLY THING CALLED CANCER. And this challenge is nothing compared to those with cancer have to face on a daily basis. Both my parents had cancer. My Daddy was 70 and my beautiful Mother 49 when they went to be with our Lord in Heaven. And sadly, we all know someone either fighting their battle in remission or working to get into remission and those who went to be with Our Lord in Heaven. Last year my team (just me, myself, and I) GBY9 (stands for “God Bless You 9”, number 9 being my parents’ lucky number) raised $13,000. This was good for sixth place in fundraising, and top ten among 147 amazing men and women. $660,000 was raised in total for Roswell and the fight against cancer. 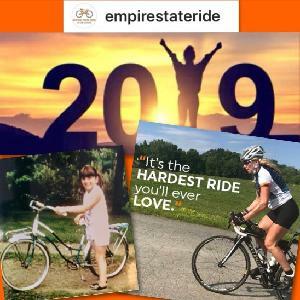 I must raise a minimum of $3,500 to be able to do the Empire State Ride. And my TEAM GBY9 goal this year is to raise $1,000 more than last year, for a goal of $14,000. Every dollar over the goal will be a huge blessing! The 500+ mile ride from NYC to Niagara Falls spans 7 days, sleeping in a tent each night, “I am so not a camper”. But it is for a great cause, THE FIGHT AGAINST THAT UGLY THING CALLED CANCER!!! 4) $10,000 an EMPIRE STATE RIDE commemorative keepsake. If you would like to make a donation please do, and if not, it’s okay too. No amount is to small and you are a part of my team GBY9. And please give me a name /names of anyone you would like me to ride for and I will carry them throughout my journey, close to my heart, and in prayer on a list I will create. Thank you again from the bottom of my heart for your generosity. Cromwell Family-May the Wind be @ Your Back Maria! J. Rutowski of Elma, Inc.